It's Saturday and therefore the student/university topics are back; hoooray! Let's have a party! So, unfortunately it's not all fun and games now that I have finished my second year; it's time to get serious and start thinking, researching and spending my life thinking about what I'm going to do for my dissertation, how I'm going to start it and how the heck I'm going to get through my final year without having major break downs. I guess that's where the fun and games come into it. Right? Around a month ago I finally decided my dissertation topic after thinking about it for way over a month; it felt like it took forever. I decided to do a topic based on learning through play and children with Autism. Does learning through play help children with Autism to enhance their learning through the National Curriculum? This was an area I was rather interested it and Special Education is definitely a favourite of mine, and working in the National Curriculum with a boy with Autism, I've always wondered whether play helps him or not even though he's in year 2, going into year 3. So this topic was all well and good until I researched this and couldn't really find much information; something which isn't helpful when my dissertation has to be based upon secondary research. Ugh. As I cannot find any information and I've decided I'm completely changing my thought process at the same time, I've decided that I'm going to base my dissertation upon Psychology but related it to children in school. I'm sure one of you are questioning how this is possible, but it is. Psychology occurs on a daily basis in a school, even when you think it doesn't. 1. Go with what you love the most. So although I absolutely love psychology, there are questions that I prefer more than others and this will always be the case. So rule out the questions which you're not too keen on and go with the question which you love the most and find most interesting; you'll enjoy your final year more. Something I've found is some topics have more research out there than others. Google is the best place, but sometimes it doesn't give you what you always need and you will always find more information on one topic than you will another. So if you have more than one idea for your dissertation, research each of them and find out what's out there first before you decide. You need reliable and a heck load of sources! 3. Can you divide it into different topics? Something you have to do in a dissertation is split your question up into different areas so you can evaluate them all in depth. Can you do this with the question you're going for? Is there more too it than just the question? Draft a plan first and see where it goes; if you cannot think of anything, don't go with that question. 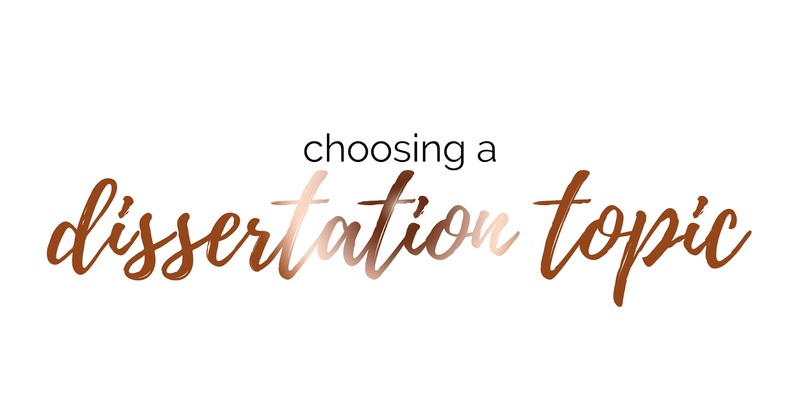 Let me know if you're starting your dissertation in September; what are you doing yours on?